Anyone in B2B or B2C tech public relations knows that crowdfunding is an exciting part of the startup community and a key source of grassroots support for many pre-revenue business ventures. Since the Pebble Watch was launched in 2012 and became Kickstarter’s breakout success, the crowdfunding dream has captured the imagination of many cash-strapped entrepreneurs. It serves as proof of concept for exciting ideas, an outlet for fledgling companies to tell their story, and a way to build ties with future customers. And who wouldn’t want to be in the same shoes as the founders of Oculus Rift, a crowdfunded technology that was eventually acquired by Facebook for $2 billion? But success for a crowdfunded campaign often hinges on the visibility earned through public relations outreach, and the field has become, well, crowded, which means generating great PR can be a challenge. And as crowdfunding has grown, it has earned mixed reviews. Stories of mismanaged project funds and even outright embezzlement, startups that fail to deliver, and general operational missteps have all contributed to media mistrust. Because third-party validation is key to generating visibility for any crowdfunded campaigns, this presents a challenge – and an opportunity – for PRs to find ways to help them succeed. Point out pitfalls. And do it before the campaign launches. Media can be cynical, and some feel they’ve been burned by projects that never came to fruition. It’s important to bulletproof the concept, anticipate problems and questions, and make a credible case for your offering before you launch the page. Make sure the company is legit, with a tax ID number, business bank account and employees whose bios and backgrounds are verifiable. Remember the key ingredient of many successful crowdfunded campaigns is a compelling story. Without it, the idea won’t capture attention in the crucial early stages. Make sure your story is simple, straightforward, and authentic. Don’t get lost in technical details or a meandering narrative that tells too much and confuses the listener. Keep it crisp and focused on the benefit. Tee up media relationships. A friends and family network is important in order to help drive early momentum, but features in key media outlets is the best way to gain visibility. Prioritize your media launch targets. During embargo outreach planning, select the outlets that will drive the most traffic at publication. TechCrunch, Engadget, and BGR (among others) are key for maximizing traction and pledge conversions from the very beginning. Bonus tip: Crowdfunded projects work best when they land on the front page of the crowdfunding site. Platforms like Indiegogo choose front-page performers based on their ability to raise a certain percentage of funds within a given time period. Indiegogo suggests that a campaign should ideally raise 30% of its goal within the first 25% of the project’s lifetime to be singled out. The goal is to show traction early on and tout your success to the community. Once you have some visibility, build social proof through interaction with advisors, customers, the media, or investors. Smart lighting app Plum has done this very successfully as the company has grown. Make sure the page is as attractive as it can be. 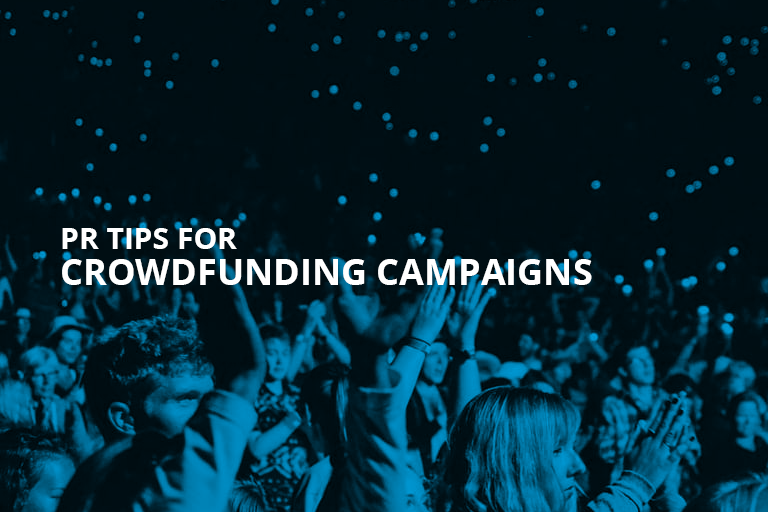 PR and design experts brought in early can help shape a client’s crowdfunding page. A concise background story, set of perks, and attractive presentation of the product’s value will resonate with target audiences. Consider front-loading the campaign with an offer of early-bird access – whether that’s internally funneling donations from employees, or having it come from one source before going live with the campaign. The former is usually preferable, as it projects campaign momentum straight out of the gate. Here is FidgetCube and some other pages that got it right. Manage expectations throughout the process. If the crowdfunding route is appropriate, the PR team should make it clear that press coverage is not a guarantee of increased donations. Press will bring more exposure and brand awareness, but locking in donations requires a sustained effort on many fronts. Targeted social support across many platforms is important. It makes sense to identify and engage with communities that match up, demographically and in attitudes, values, and lifestyles, with the crowdfunded product. Beyond earned media, proven marketing tools like campaign videos will help drive potential donors to the campaign; pages with video are 85% more likely to achieve their funding goals, and the more engaging they are, the more shares they’ll receive. Keep up the post-launch momentum. As soon as the agreed upon embargoed publications run their stories, conduct a much wider push of the launch announcement press release to capitalize on initial momentum and increase coverage in all relevant verticals. Then, publish milestones. If the crowdfunding page reaches a significant goal in a record amount of time (like 50% funded in 24 hours), it’s important to inform key contacts that the campaign is progressing and projected to complete its goal. This has a dual purpose. It’ll validate the journalists’ decisions to report on your project – knowing that they didn’t get burned on a campaign that won’t deliver. And it may result in additional exposure from contacts that didn’t cover the campaign from the beginning. Stoke the social media fires. Once the campaign is up and running, PR teams need to push for more volume on the social media shareability and advertising front. While advertising isn’t required, considering ads on Facebook or sponsored posts on Twitter can help boost exposure for relevant audiences in certain industry verticals who’ve shown an affinity for products such as yours. Crowdfunding campaigns have their pros and cons, but there’s plenty of evidence that the business model can be powerful if startups and their PR teams know how to navigate from start to finish.